Once again GeniAus has spurred us on to consider our geneachievements for 2014 and Accentuate the Positive. It’s all too easy to be daunted by the tasks ahead, or the (perceived?) deficiencies in our past year of research. It has made me realise that I achieved more than I thought – I tend to be a girl with a half-empty glass. Thanks Jill for encouraging us. An elusive ancestor I found was…still hunting for James Sherry aka McSharry but I have an APB out on him. A precious family photo I found was: While in Sydney I visited my 4th cousin and scanned heaps of her trove of family photos with the Flip Pal. Thomas Zeller’s grave at Tyne Cot cemetery. 3. An ancestor’s grave I found was…while I wasn’t specifically grave-hunting for ancestors this year we did visit quite a few military cemeteries in northern France and Belgium. 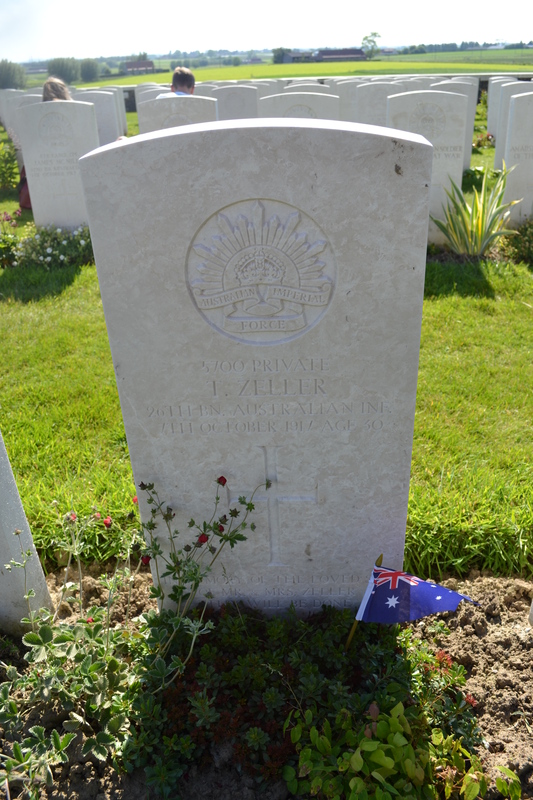 I was able to place an Australian flag on the Tyne Cot grave of one of the Dorfprozelten descendants, Thomas Zeller. 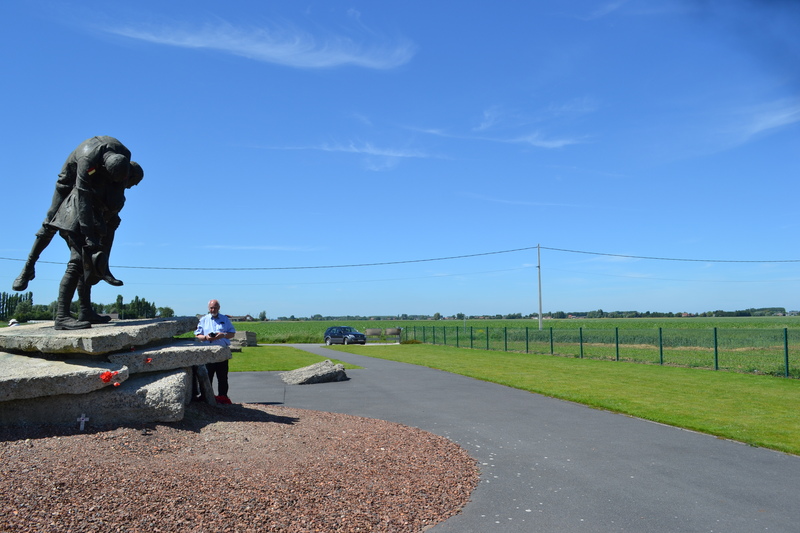 It was especially sobering to stand where Mr Cassmob’s great-uncle, heading the 54th Battalion, was positioned during the Battle of Fromelles. 4. An important vital record I found was discovery I made was identifying the ship my ancestor’s sister arrived on. This was Bridget O’Brien, sister to Mary O’Brien on the Florentia….but why is her name not on the manifest?? And despite searching I’ve found not a single vital record/primary document. 5. A newly found family member shared mutual discoveries of our Dorfprozelten ancestry, another of DNA, another family photos. 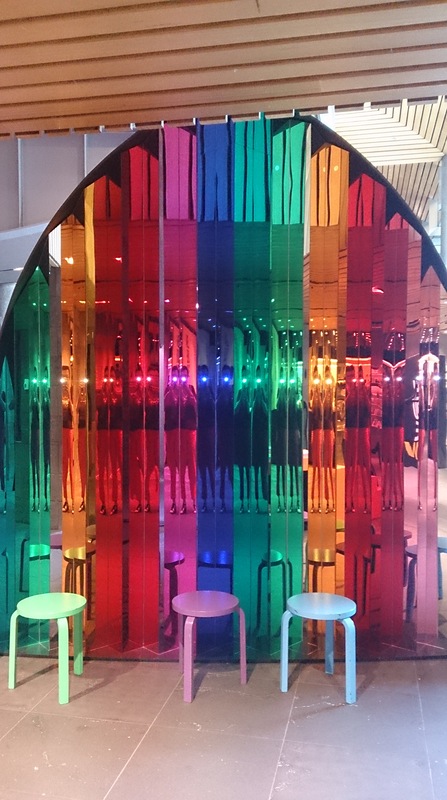 I also enjoyed connecting with an Aussie living in Sweden, who shares my Sydney cousin, but from the paternal rather than maternal line. 6. A geneasurprise I received was finding the clues which led to identifiying that Bridget O’Brien almost certainly arrived on the Florentia….it’s only taken 27 years to find a clue. Thanks Trove! I was also surprised to discover that George Kunkel had all his assets sold, possibly why they ended up following the railway line. I had another railway geneasurprise when we visited Poperinghe station to see where my grandfather was stationed during World War I. In a WDYTYA moment, a railway worker spoke to us and provided me with print-outs of photos from that era. Our tour guide was more astonished than I was. 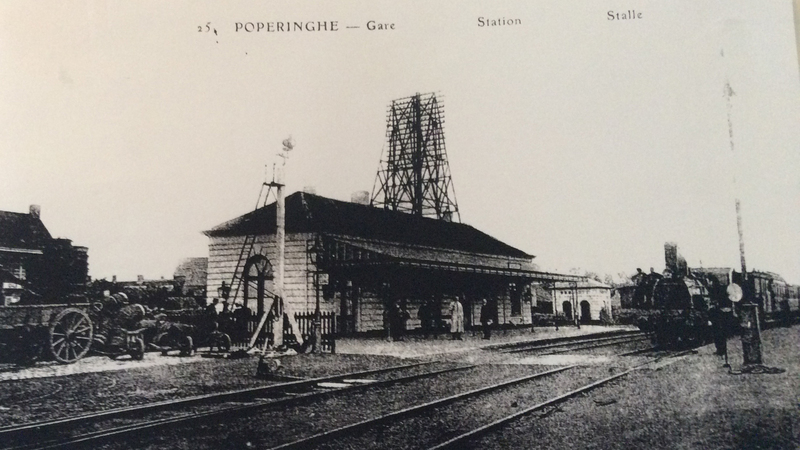 Poperinghe Railway Station near the time when my grandfather served there. 7. My 2014 blog posts that I was particularly proud of was the stories about the Florentia. You can read them here, here and here and the one that started it, on 29 December 2013. 8. My 2014 blog post that received a large number of hits or comments was….my blog likes went up, my comments went down, possibly partly because I’ve been a neglectful commenter lately. Probably the best was my 5th blogiversary post recently with my goals and reflections. In a more general context I was proud of my Three Rs of Genealogical Research on the collaborative Worldwide Genealogy blog in September…it attracted lots of interest. 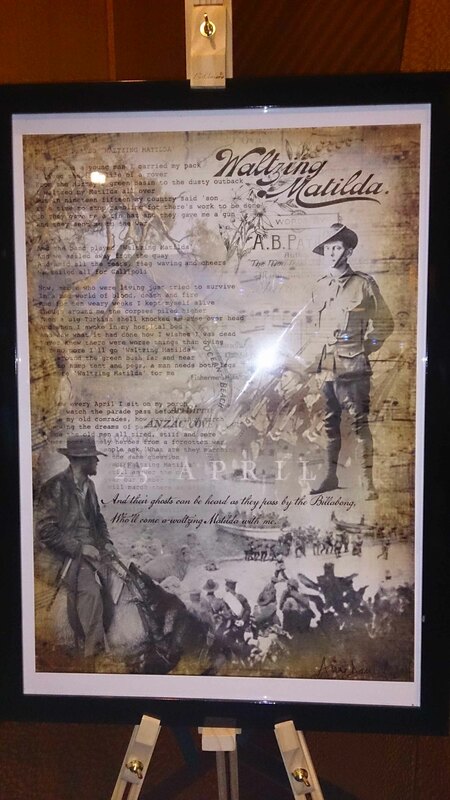 We also seemed to have a bit of fun with my Australia Day Geneameme and the National Family History Month Geneameme. Thanks everyone for joining in! I also had fun, along with many others, doing Sharn’s Christmas geneameme. 9. A new piece of software I mastered was…not sure I did. Even though I’m using Evernote a lot now, I’m quite sure I haven’t mastered it. I bought the offline version before we went travelling and it was pure gold for keeping track of documents, travel arrangements etc. 10. A social media tool I enjoyed using for genealogy was Pinterest, when I just want a chill-out and fun. I’m enjoying Facebook far more now I’m in touch with my genimates. 11. 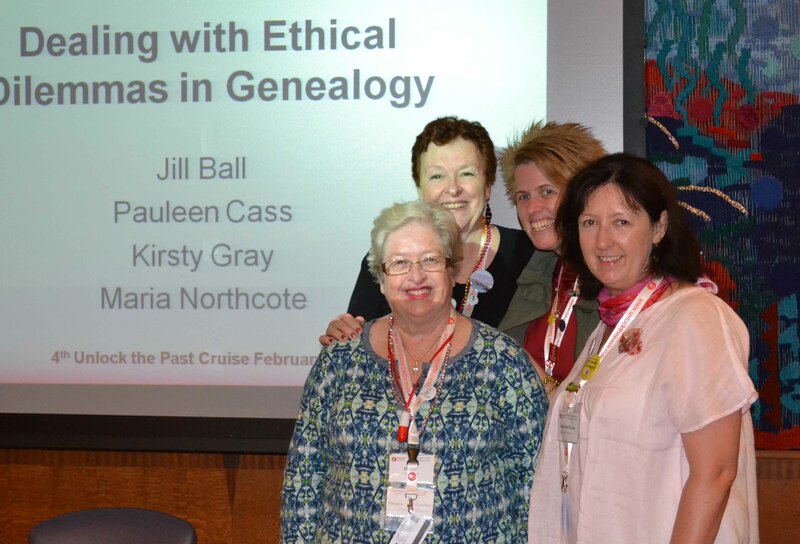 A genealogy conference from which I learnt something new was all the sessions on the Unlock the Past cruise in February 2014. You can read my synopses here. 12. I am proud of the presentation I gave on the UTP February Cruise. The subject was Becoming a fan of FANs which the attendees told me they really enjoyed. You can read my presentation slides here. I also really enjoyed Jill Ball’s “fireside” chat where people shared their favourite books. A journal/magazine article I had published was…none. I taught a friend how to…not sure…I often seem to be rabbiting on to people about how a geniechallenge might be pursued. 15. A genealogy book that taught me something new was…I have downloaded lots of genealogical Kindle books which I’ve started but many are still only partly read. When I take time out to read I tend to read frivolous crime novels etc so discovering Steve Robinson’s and Nathan Goodwin’s genealogical mysteries was a treat. I was also astonished to find references to what looks like my Callaghan family from Courtown, Wexford in the book Sam Reilly: Ace of Spies which has lots of geneadata to be followed up in the Irish parish registers. 16. A great repository/archive/library I visited was the Tasmanian Archives and, as always, Queensland Archives, where I did a lot of preparation for my talk on hospitals for QFHS on Accidents, Illness and Death (not one of my most successful moments in 2014 – needs a major revamp). 17. A new history book I enjoyed was Hugh Dolan’s 36 Days which tips our inherited ideas on Gallipoli on their head. As we were visiting Gallipoli mid-2014 I also read Matt McLachlan’s Gallipoli: the Battlefield Guide and Peter Pedersens ANZACs on the Western Front and Fromelles. 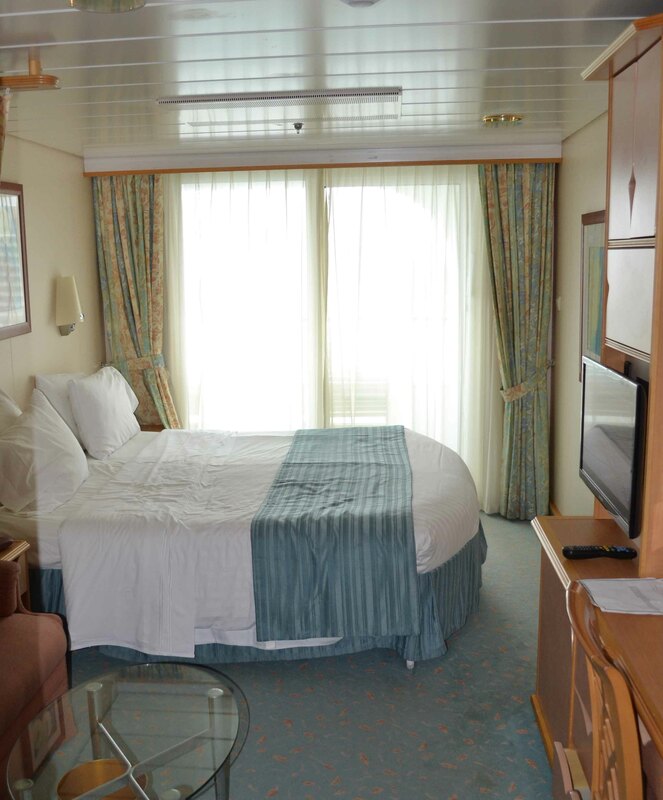 Voyage of the Seas dwarfs most other ships, just imagine it beside a barque like Florentia. 18. 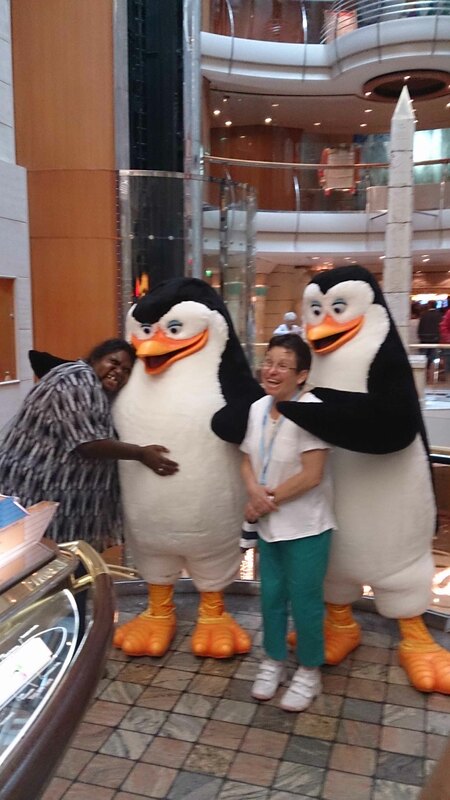 It was exciting to finally meet lots of my genimates on the UTP cruise as well as a new cousin in Melbourne. I was also pleased to spend time with other genimates on shore during the year, as well as meeting Angela from The Silver Voice in Brisbane. 19. A geneadventure I enjoyed was going cruising for the first time with a bunch of mates following our genie-obsession. On ship or on shore, we had a ton of fun! 20. Another positive I would like to share is how our Kiva Genealogists for Families’ loans have grown as the repayments have been reinvested. 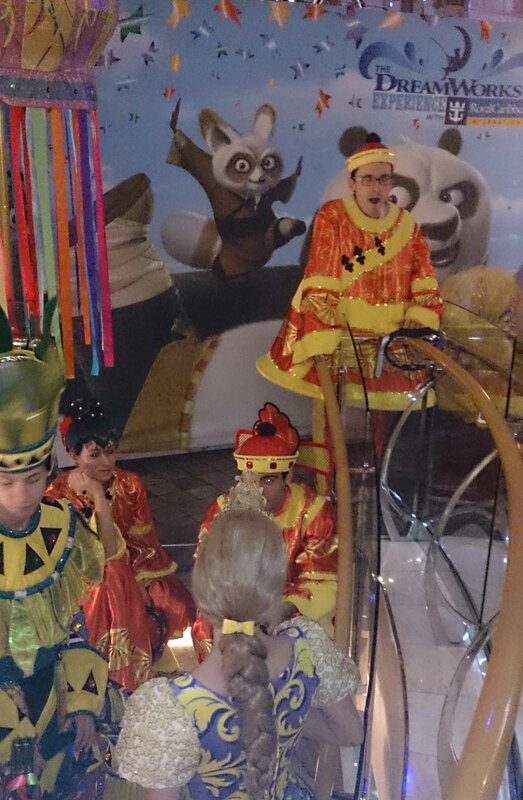 Over Christmas I roped in my two older grandchildren and got them to help me to make December’s loans. I will make a habit of this over 2015 to try to teach them about giving to those in need. Extract from Inside History magazine, Sept-Oct 2014, page 49. I originally omitted to mention Alex’s inspiration to revamp our blogs during the year. Thanks Alex (aka Family Tree Frog) for giving us a nudge to do this and Susan for reminding me to mention it. You can read what I did to mine here. 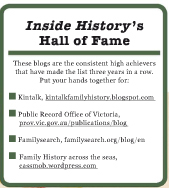 I was also very pleased to be listed in Inside History’s Top 50 blogs again in 2014 and consequently earning an entry in their Hall of Fame. 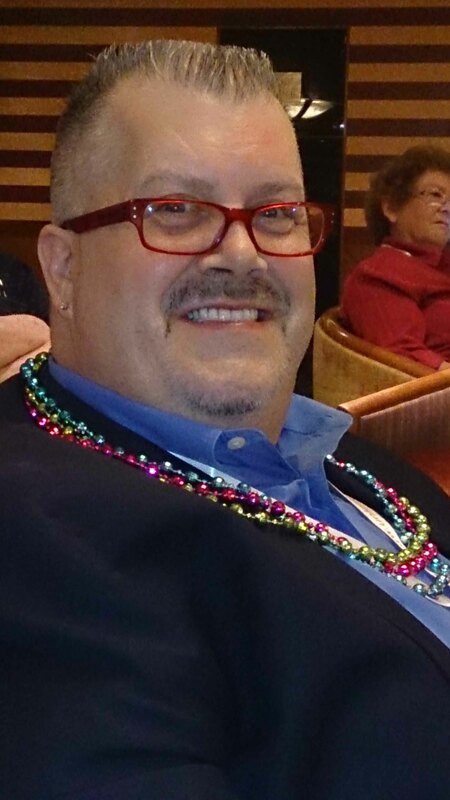 This was topped off by being voted in as a Genealogy Rockstar again in 2014, even though I think there are many other equally good geneabloggers out there in the geneaworld. Mr Cassmob at the Cobbers memorial at Fromelles. This is where the 54th Bn under Lt Col WEH Cass reached during the battle. Wednesday was Day 9 and the final day of our cruise as we headed for Sydney with another warning from the Captain that there would be “motion on the ocean” but that he had no control over it, being subject to a “higher power even than my wife’s”. The UTP cruisers had a full schedule of activities for the day ahead with some earlier talks rescheduled due to illness. It was difficult to buckle down to being alert and “on plan” after the time in port at Hobart and I confess I made this one of my “time out” days, missing a few sessions. Inevitably there were clashes in the programming so I still missed some I’d liked to have heard. Helen Smith kicked off the morning with excellent advice to prepare a family tree (genogram) without names but with gender, cause of death and age at death. Even reflecting quickly on the topic as Helen spoke I could see some scary family health risks, though to be fair, none that were a huge surprise….my family is largely blessed with longevity. She asked “what risk factors do you have?” and encouraged us to take preventive health measures to ensure we live long enough to do our family history. Also to talk with family members about health conditions such as miscarriages, mental health issues or cancers, but being aware of people’s sensitivities around the topic. Key messages: Approach your family tree using health data, rather than names and see what health conditions are prevalent. Talk to family members to tease out illnesses other than the specific cause of death. Chris Paton was as always amusing and informative. 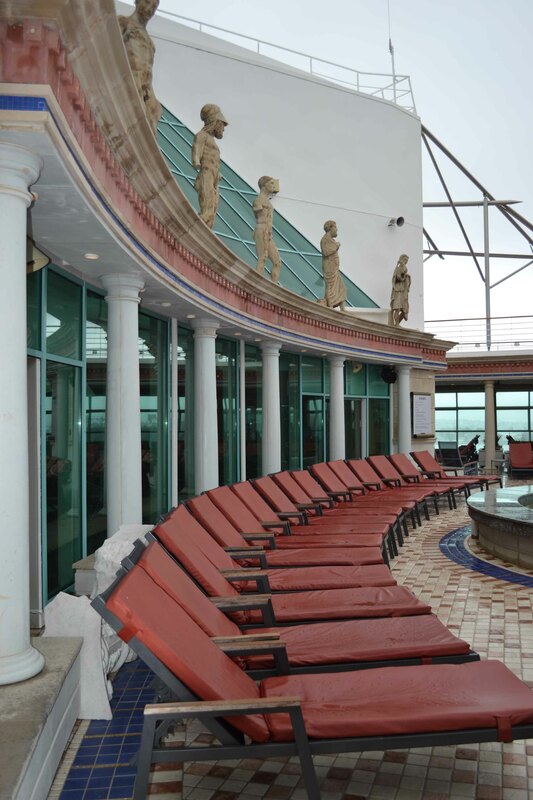 Or on the pool deck….but I did make it to the day spa. Chris also mentioned the Revision books (aka Cancellation Books) which update the original Griffith Valuations. These are absolutely gold in terms of tracing who took over your family’s property over the decades and can provide clues to when someone died. They are available through the LDS Family History Centres by ordering in the microfilm, but they’re very difficult to follow because they’re only in black and white whereas the originals are in colour so you can follow the entry across the page. The Valuation Office in Dublin will send a copy to you for E40 if you know where you’re looking. It may be expensive but it’s cheaper than a trip to Ireland, though nowhere near as much fun! Other land records are available at different sites eg the Defaulters’ Books (for those who refused to pay the Tithes) is on FindMyPast as are the Landed Estate Court Records. The National University of Ireland in Galway has a database on the landed estates of Munster and Connacht…the provinces where so many Irish in Australia came from. This database will let you search for the owners of estates and whether there might be surviving estate records (but do look elsewhere as well). Those with Clare ancestry can use the wonderful Clare Library site to learn more about their ancestor’s parish and the estates before turning to this database. PRONI (the Public Records Office of Northern Ireland) also has great information for those with northern Irish ancestry, including a national schools index. Key messages: All of the above. If you haven’t used any of these resources then check them out. My advice: Land records are a key gateway into Irish genealogy though you do need to know where your ancestor came from (well anyone will tell you that!). If you’re struggling to locate their townland or village check out obituaries, funeral notices and funeral directors, newspaper stories, the name they called their house/property, gravestones, family stories, immigration records and so on. Be lateral, sometimes that’s the only way you’ll find them. 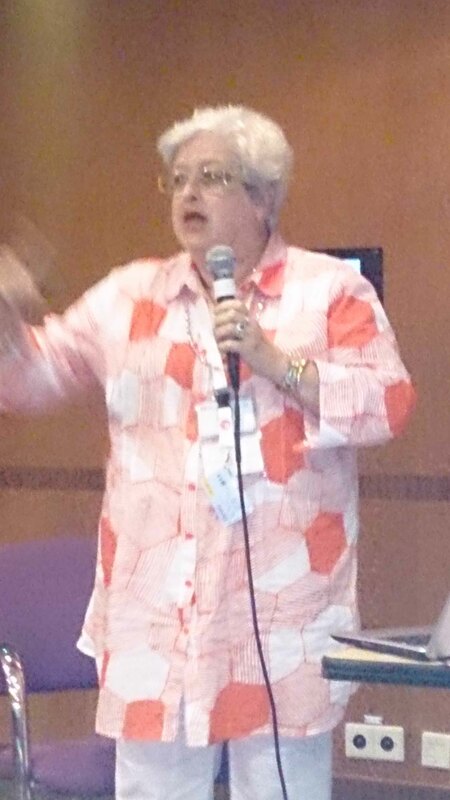 I didn’t attend all the Family Historian sessions offered by Jane, largely because of clashes with other sessions. I have the program on my computer and have imported some data but have yet to really play with it. The program I have used for years is an Australian one, Relatively Yours, which offers great flexibility but doesn’t export to other programs as consistently as I’d like. Key message (for me): Get my act together, experiment with Family Historian and decide if it suits my purposes. Kerry Farmer provides really clear advice in her presentations and the DNA session was no different. In theory I understand the process and significance but ….every time I turn my mind to this task I wonder how it can still befuddle me despite five years of science training, albeit a long time ago. One of my stumbling blocks is that I don’t have any other (known) relatives who have tested and all the 3rd or 4th cousins who pop up only identify relations within the USA. Kerry suggests asking them if they know of anywhere overseas their families came from. Perhaps it’s time to follow Kerry’s lead and offer to pay for tests for key people in my family puzzles. Key message (for me): try, try again to understand my DNA results, read blog posts, download the data and try to make more sense of it. 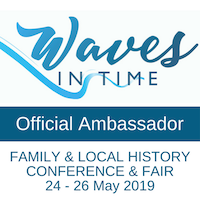 Kerry’s tips: get other family members tested, join the haplogroup that fits your profile (and perhaps a surname group, if applicable), and follow Family Tree DNA on Facebook to get early warning of special deals. There are also some good webinars online. Plainly there’s lots of homework to be done, and some concentrated thinking instead of head-in-a-bucket methods. Shauna Hicks gave a great talk on benevolent asylums and similar that housed consumptive patients or the infirm. The key places to find information about these is the relevant archive and they can be rich sources of information which can solve many mysteries or add more information not available elsewhere –I’ve certainly had great success with them. Many of the archives have at least some of these records indexed so do have a look at them. My notes on Shauna’s talk include a lot of reminders of action to follow up. Key messages: Don’t forget to use an advanced google search combined with the relevant URL eg www.archives.qld.gov.au. 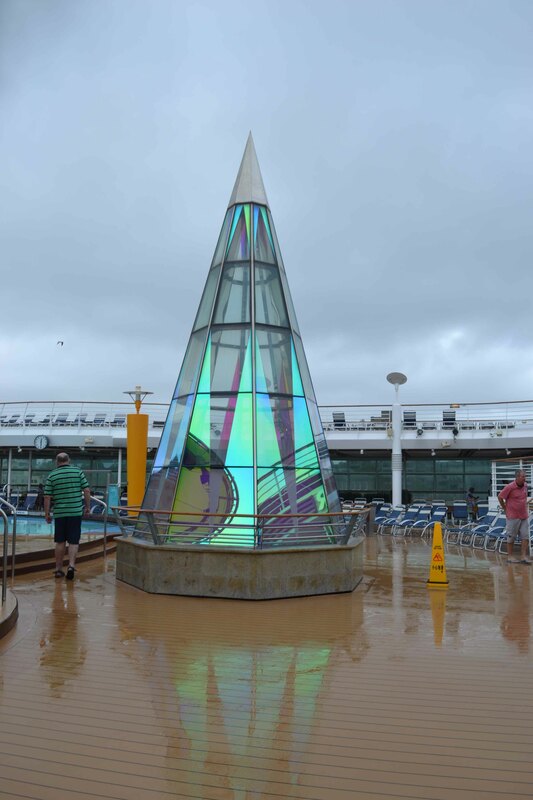 It was a shame to know the cruise was coming to an end even though our brains were getting rather befuddled and full of information. Once again our table had a lovely time chatting –what a pleasure it was to spend time with Cathy, Dot, Marlene and Thomas…we never did see the other person who had been allocated to our table (we must have looked scary). 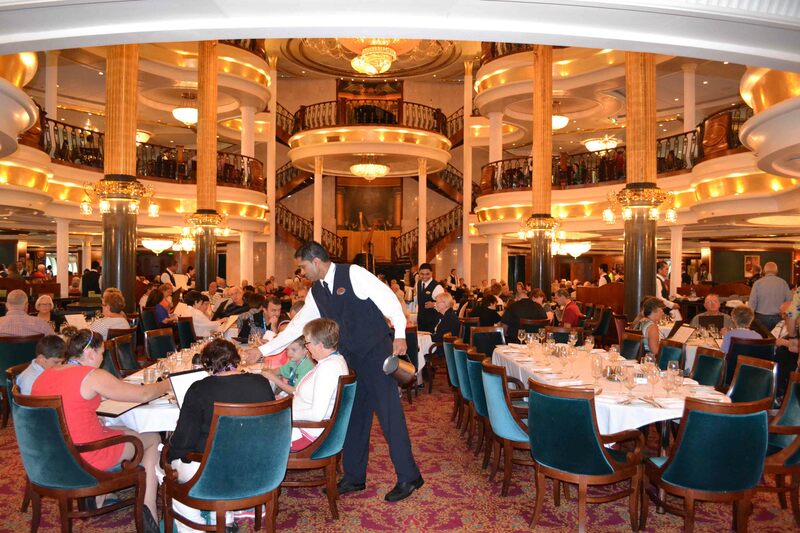 Nearly every evening we were among the last tables to leave the dining room. Thanks for your company each night my new friends! The evening post-dinner session was held back in Cleopatra’s Needle and there were lots of prizes handed out to participants and my table mates were all thrilled that the big prize of $2500 towards any Unlock the Past cruise went to our new-found friend Marlene!! I think we were more excited than she was as she seemed quite stunned but accepted her prize with what is her characteristic graciousness. Chris Paton gave the final presentation of the conference speaking on British civilian POWs in the First World War. While it has specific relevance to his family it had broader implications and was a fascinating study of Ruhleben Internment Camp. After the nuts and bolts of the conference talks it was intriguing to listen to a broader historical topic. It was amazing to hear the diversity of learning that occurred in the camp as professionals and academics (and no doubt tradesmen) passed their skills on to their fellow internees. Thank you to Unlock the Past for the learning opportunity of a conference held on board ship. 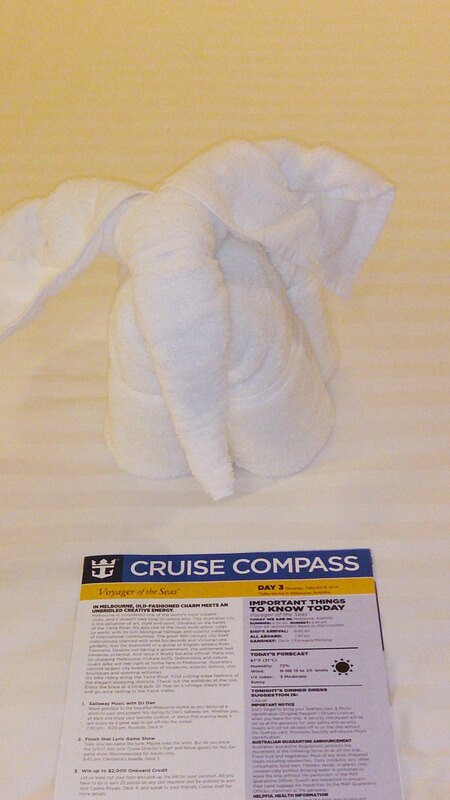 I thoroughly enjoyed myself despite my earlier “me, cruise…never!” attitude. Now I think I may have caught the cruising bug! I will most likely write a separate post in a day or two on my general perspectives of the cruise. 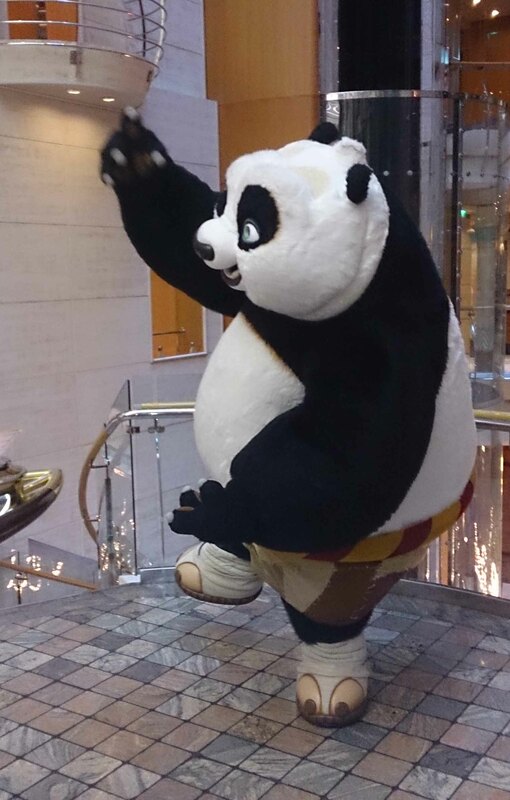 Thank you also to each of you for journeying along with me…I hope you’ve got a sense of the fun we had, and that I’ve shared some of the learning opportunities. 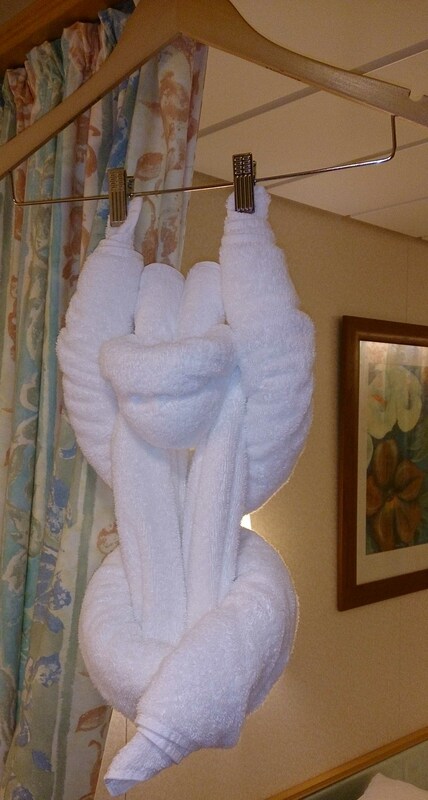 The steward’s towel monkey…our final towel creation. It was a longish voyage from Adelaide to Hobart (yes, I know, our ancestors would disagree!) so we had a combination day with genealogy and then some sight-seeing after our arrival in port at 2pm. I loved arriving by sea into Hobart because it brought to mind that Mary O’Brien had probably come this way before me, back on 4 April 1853. Just imagine the relief of all those on board the Florentia after four and a half months at sea, with a diminishing supply of provisions. Hobart is such a pretty town with its encircling hills and Mount Wellington towering over the city. It may not have the drama of Sydney’s sandstone cliffs but it has an amiable, welcoming vibe. I could happily live in Hobart but that wouldn’t be an improvement on the remoteness of Darwin, and my heat-loving tropical friends would simply refuse to visit. It must surely have been appealing though to the immigrants from Ireland, England and Wales on board the Florentia. (Apologies to my mates who are heartily sick of Mary O’Brien from County Clare). 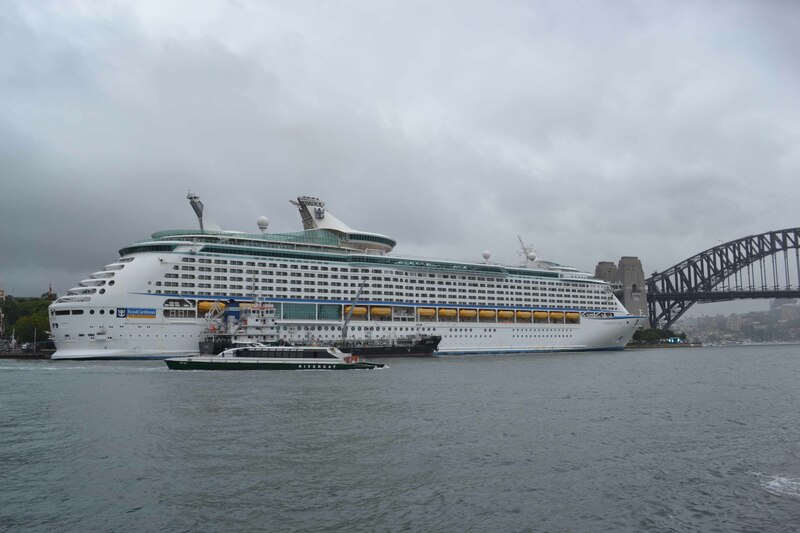 It was a public holiday for Regatta Day as the captain brought his huge ship to dock at the wharf. Little boats were skimming round the harbour but my friend Sharn and I chose to head off along the wharf to Salamanca Place and Battery Point for some sight-seeing. Having decided to stop for a coffee, we joined other Unlock the Past Cruisers for a chat at a local coffee shop. Chris Paton again unravelled the complexities and variability of Scottish records with his talk Scottish marriage: instantly buckled for life. Scotland may be (currently) part of the UK, but Scottish family history is really not the same as that for England, make no mistake! Among the warnings Chris issued is that people only needed to have a witness to their commitment and the marriage was a valid one, and also the the (wonderful) ScotlandsPeople only has marriages for the Church of Scotland and the Roman Catholic Churches. If you can’t find your ancestors you may wish to follow up the Statistical Accounts to see which other denominations were active in their parish at the time. After arrival in Hobart people scattered to their various activities and plans. I was fortunate to spent a few fun hours with fellow genie and photo obsessive, Sharn from Family History 4 U. Some of my photos from the day will eventually make it to my photo and travel blog Tropical Territory and Travel which has been sadly neglected of late, like other things. Although the weather looked a little precarious in the beginning it turned into a magnificent afternoon with crystal clear vivid blue skies. The day finished with a very good fireworks display over the harbour, with resounding toots of the ship’s “horn” in thanks for the display. It certainly gathered the crowds on the high decks and afterwards I was invited to join my table-mates, Cathy and Dot and friend Maria in the cocktail bar on Deck 14…a very pleasant end to the day. Day 8 was another full day in port and imagine our surprise to look out from the verandah and see another cruise ship had arrived overnight. 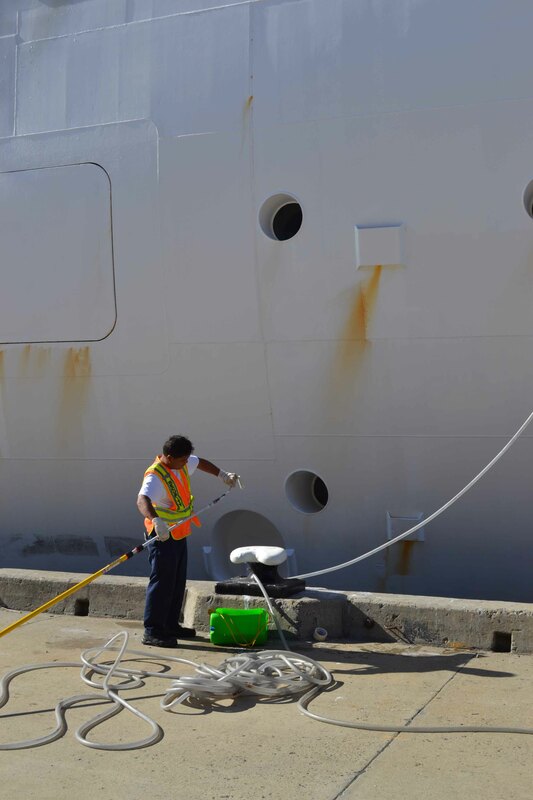 It was interesting to see that life at sea involves little down-time for the crew who were busy painting any blemishes on the ship’s hull. My priority for Day 8 ( a shore day) was to hit the archives in Hobart although initially I’d hoped to go to the Cascade Factory. 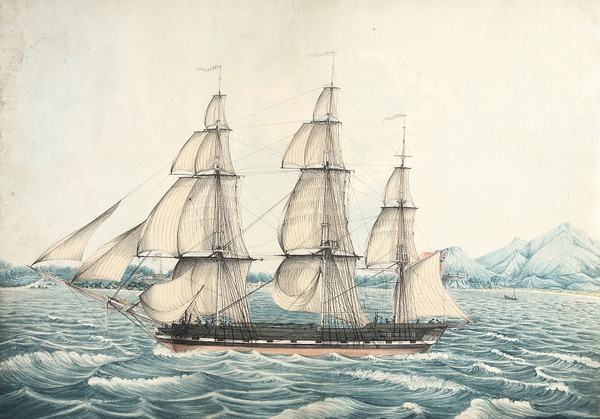 However that was superseded by following up all possible leads on the Florentia and whether they would offer any further clues to whether Mary O’Brien was on board as an unassisted immigrant when the ship sailed into Hobart. Despite searching a range of pre-ordered documents, the answers were still ambiguous by the end of the day. My research outcomes re the Florentia will be the subject of an upcoming post. 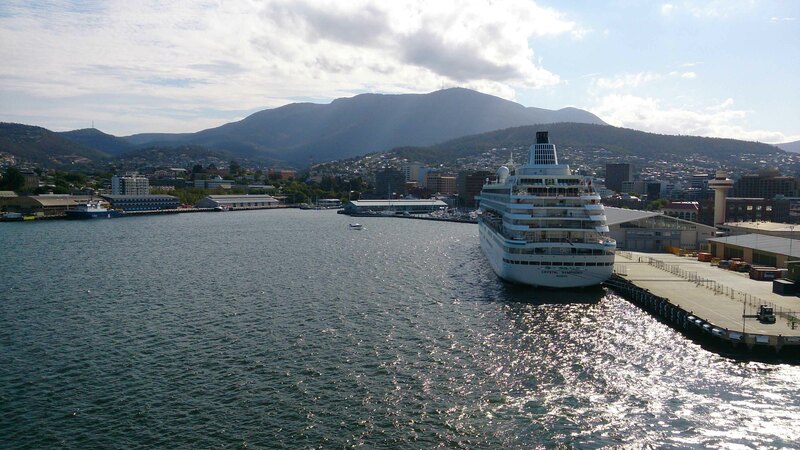 And so we sailed from Hobart Town with my thoughts reflecting on whether Mary O’Brien and her sister Bridget were similarly sorry to leave this pretty place behind to head north to Moreton Bay, or in my case, to Sydney Town. 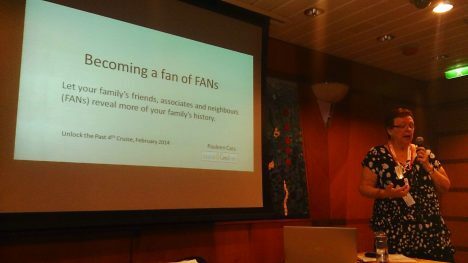 Before I tell you a little about Day 6 of our genea-journey, for those who are interested, the slides from my talk Becoming a fan of FANs is now on a separate tab on my blog under Presentations. Here is a quick link to it. 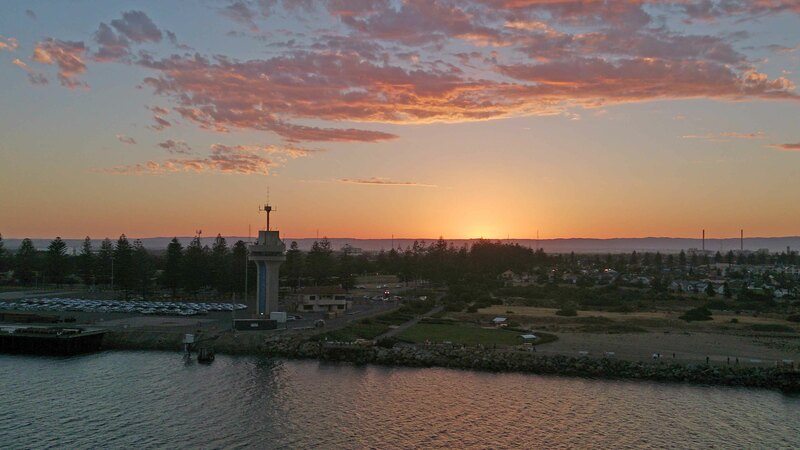 Day 6 of our adventure was a sea-day en route between Adelaide and Hobart. The Captain warned us there’d be “motion on the ocean” but it was pretty good. 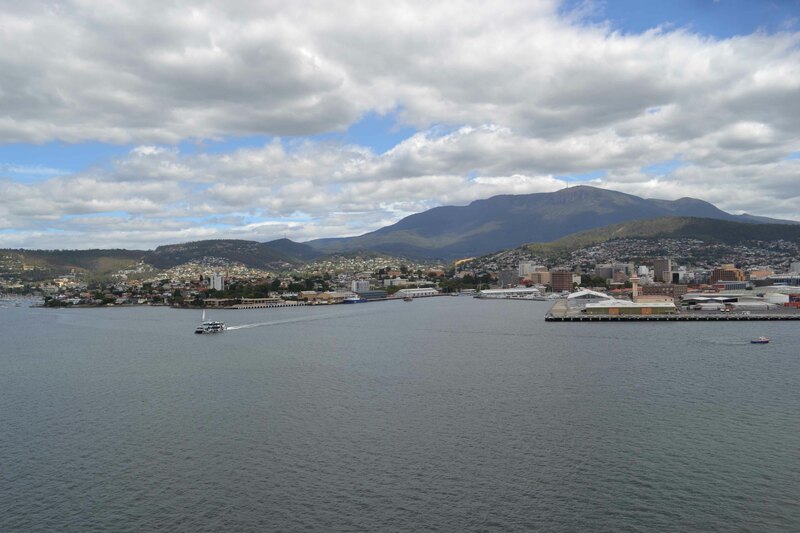 By the time we got to Hobart we were swaying on land, not ocean. 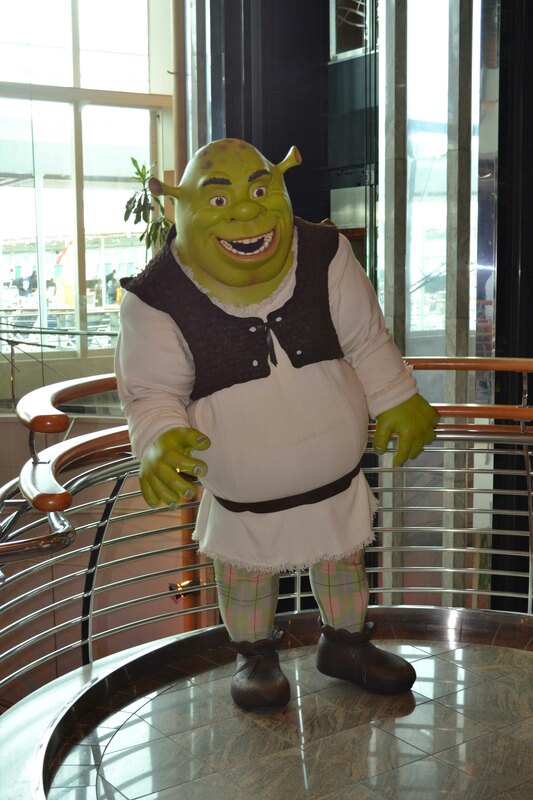 Although we were so preoccupied with the many presentations in the conference room I occasionally caught a glimpse of the featured DeamWorks characters which are a feature of Voyager of the Seas so I grabbed photos of them for the grandchildren. Although I have no convicts in my ancestry (no royalty here or abroad! Just a peasant), I just had to listen to Kerry Farmer’s talk on Convicts. Kerry is such a good presenter and sets out information clearly and concisely. Ancestry and FindMyPast both have good convict records. I was interested in the Parramatta Female Factory information and especially the Roman Catholic orphanage. She reminded us too, that it was secondary offenders who ended up in places like Moreton Bay, Port Arthur and Norfolk Island. However, there were exiles (the later convicts circa 1840s) who went directly to Moreton Bay receiving a conditional pardon on arrival. Key messages (for me): this will be useful when it comes time to do Mr Cassmob’s convict research. Convict deaths may not be registered in the normal death indexes for NSW. Jill Ball: Free Australian Websites. Jill gave us a whirlwind tour through the websites she loves to use and it’s amazing just how many wonderful sets of information are online. I’m sure some were familiar were to listeners while others were great reminders of ones we may have visited once upon a time, but had disappeared into the maw of our bookmarks or forgotten. Others provided new points of research. I found I was making notes to myself about following up different aspects of my own research through the websites. Key messages: Try the ABC (radio) podcasts, searching for genealogy. Visit Mapping our Anzacs (an ANZAC site) which is apparently being taken down “soon”. You can download the whole file so if you want information from there, do it NOW. Don’t forget Family Search wikis for information on your places. Strange as it may seem I don’t much like genealogy programs as I tend to feel straight-jacketed. I generally prefer to have narrative instead which allows for more nuances. However I’ve been using an Australian program Relatively Yours for many years because it offers the opportunity to add more personal information and allows for nuances in relationships which the bigger programs don’t always do. Having said all that, I like the clean format of Family Historian which tends to appeal to me. Because I have yet to decide between these two programs and The Master Genealogist, I attended some of Jane’s talks. When I get home I’ll be playing around with it a little while I decide. Key message for me: Come to grips with which program I want to use, and which suits my purposes best. 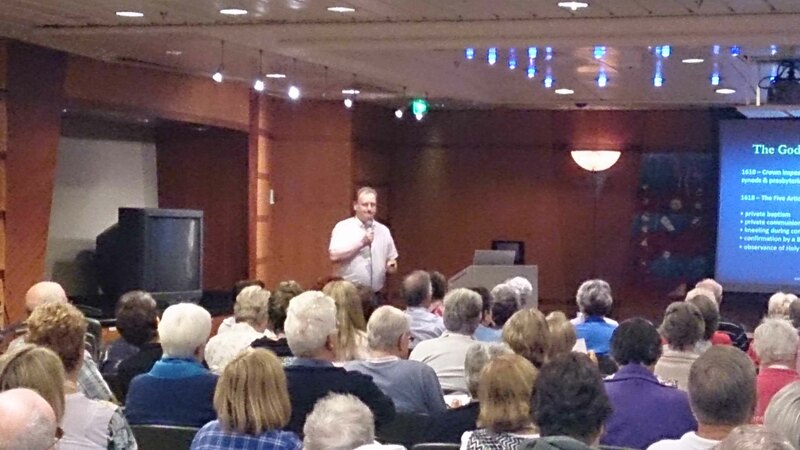 As always Thomas’s talk was full of tips for making our genealogy research more organised and efficient. I knew some of this already from reading Thomas’s and other blogger’s posts on the topic. Do you have alerts in place for your family’s street addresses, towns, your own website or blog, your areas of interest? Don’t forget you can set up a Bookcase of books which you find on Google Books and mark them private or public. Don’t shy away from “limited view” books and also use more common phrases to look at other pages. Key message: Use alerts and Google Books to the max. Kudos to Thomas for always repeating the question from the audience so everyone knows what was asked. This was such a fun activity with a group of people sharing their favourite genealogy or history books. It was interesting to see even relatively esoteric books were held by others in the group. Apart from the joy of learning about new books to follow up, it was a pleasure just to share with like-minded people. It was both heart-warming and amusing to see Maria Northcote from Genies Down Under nearly fall off her chair when one of the participants, Alan Jones, talked about his SAG thesis on Kilmihil, the very place in Clare where Maria’s ancestors came from. You can imagine the chat that ensued! After the circle, Jill Ball and I were interviewed by Maria for the podcast which was fun as well. Maria’s included her chat with Jill and I, as well as Alan Philips, Chris Paton and Joy Avery in her March podcast here. It’s very obvious we were having a good time and no longer noticed the ship was working its way through the captain’s famous “motion on the ocean”. Maria is just a delight to chat with, and so calm and quietly confident. Key message: A great opportunity for attendees to get involved and share their love of books. Thanks Jill for this inspired idea. If you’re going on a genea-cruise do make sure you add this to your list of “must attend” events. Sorry this has been so long arriving – it’s been sitting in my drafts waiting for the photos to accompany the story..and now can’t find ones I’m happy with…except a great photo of Thomas on the welcome night. I did better when I was on board ship. 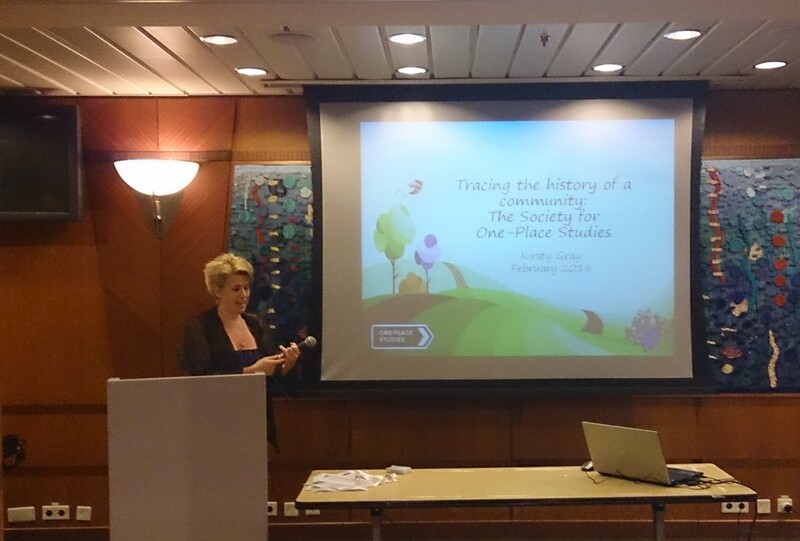 Anne Daniels from Drawing on the Past, offered sessions on photo collage for family history. 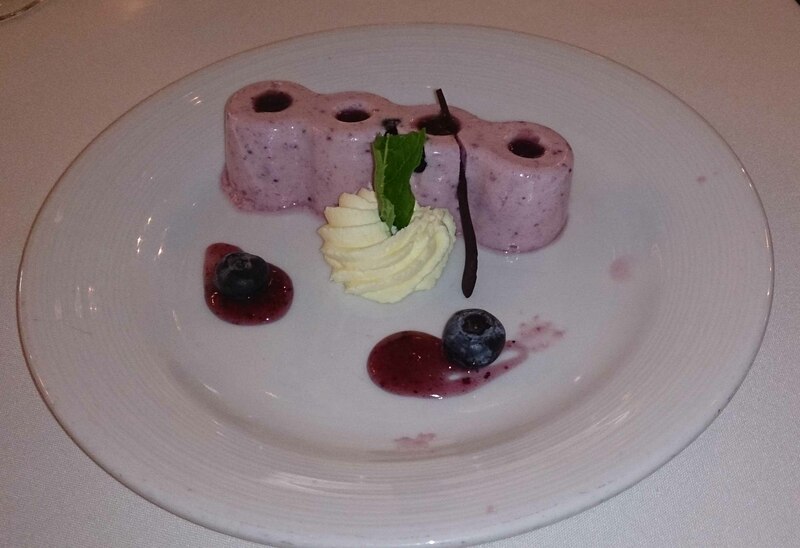 Diary of a Genea-Cruise Day 5: Hot, hot, hot!! And it’s going to be hot, hot, HOT in Adelaide, South Australia! It can’t be said that the cruise terminal in Adelaide is the most astonishing port in the world with its array of industrial buildings and containers. However a very pretty sunset over the harbour was a beautiful offset between nature and industry which I enjoyed. 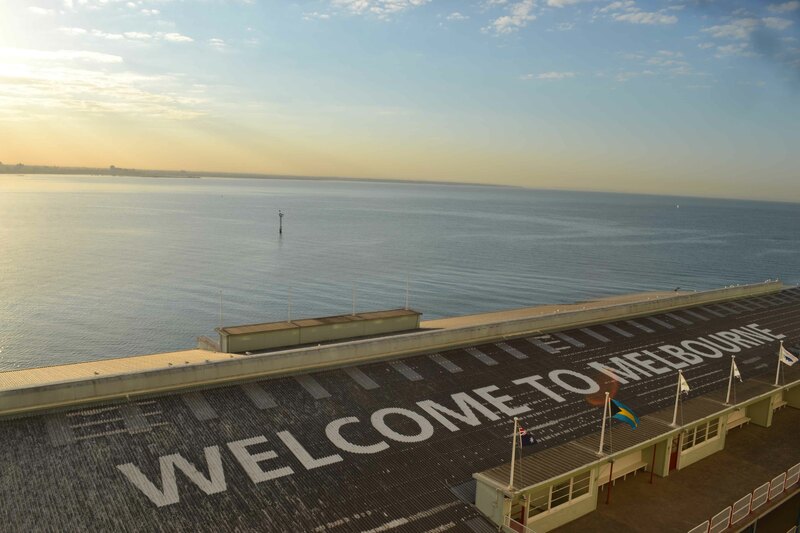 Adelaide also turned on the best show for the arriving mega-liner and its 3500 odd passengers. I liked that it had a bush band playing old Aussie songs to welcome people and while a cynical person could say the shops were there to take advantage of the tourists, they had some lovely products. With my purple, aqua and green obsession (good feminist that I am!) how could I resist a beautiful hand-painted fine merino wool scarf. 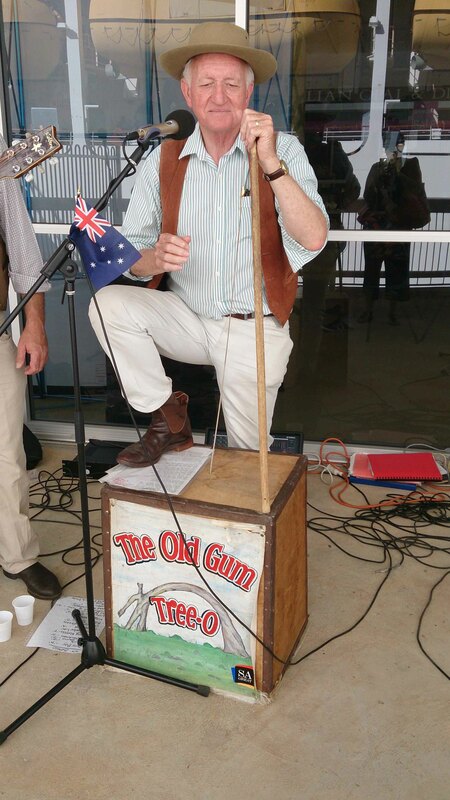 The Old Gum Tree-O. Permission received to publish photo. None of us were too thrilled at the prospect of a 42C day but it wasn’t too bad. The train from the cruise terminal into town is both convenient and efficient, and even better, free for seniors! I met a former colleague and friend for lunch at the Art Gallery, and who should be at the next table but Jackie from Jax Trax, mum Jan and “little brother”. Many genea-cruisers have taken the opportunity to meet up with friends and family at ports along the way. Back on the ship and dinner completed, our only learning activity for the day was the choice of two talks: You use WHAT for genealogy by one of my dinner-table companions, Thomas MacEntee, or Tracing the history of a community: the Society for One-Place Studies by Kirsty Gray. Kirsty Gray presents on One Place Studies. Given my obsession with Dorfprozelten, Murphys Creek (Qld), and Broadford (Co Clare, Ireland), I just had to go to Kirsty’s talk and I’m now even more committed to getting the last two registered with OPS. I love the marriage of family and local history and the diversity of understanding that can bring. Thanks to the inspiration of Thomas MacEntee and the spending spree by Jill Ball, the geneabloggers on the cruise have been wearing their blingy blogger beads. 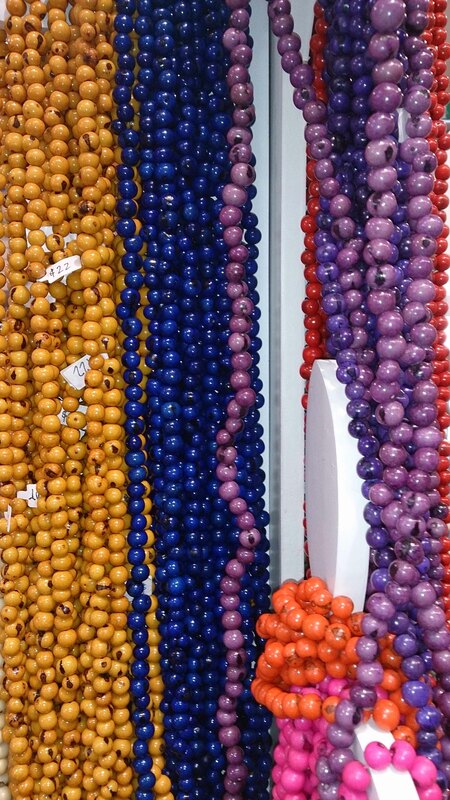 I did rather like these beads at the Art Gallery SA which I think would make pretty good blogger beads. This little piggy went to market…. It must be Melbourne. And OMG, I’ve just woken up and there goes the …. sign. After a few nights with four hours’ sleep the alarm plainly couldn’t succeed in waking me, so it was a whirlwind tour through the shower to be ready in 15 minutes. My friend Sharn (from Family History 4 U) and I went to the National Gallery of Victoria to see the Art Deco exhibition which included some magnificent costumes from the 1920s. 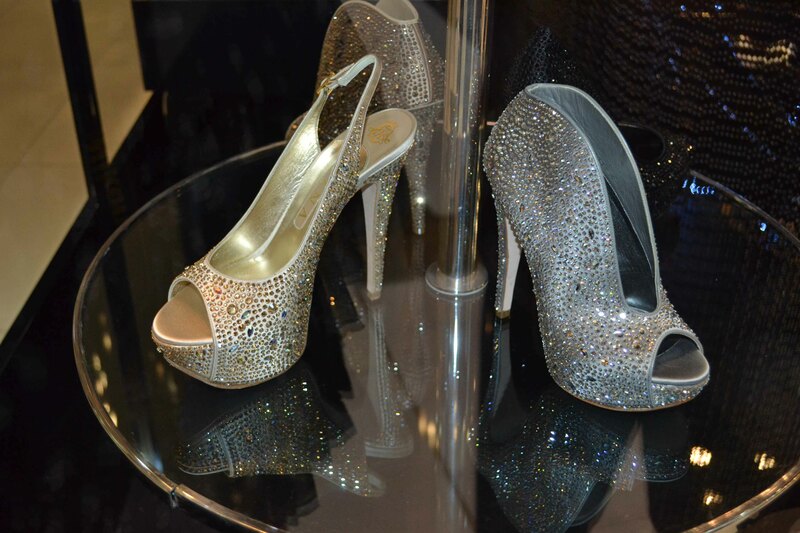 Some I’d be happy to wear today but sadly I’ve no longer got the 1920s figure I had in my youth. The photographs by Edward Steichen were amazing –dramatic and full of character, and none really the same as another. What a lovely start to the day! 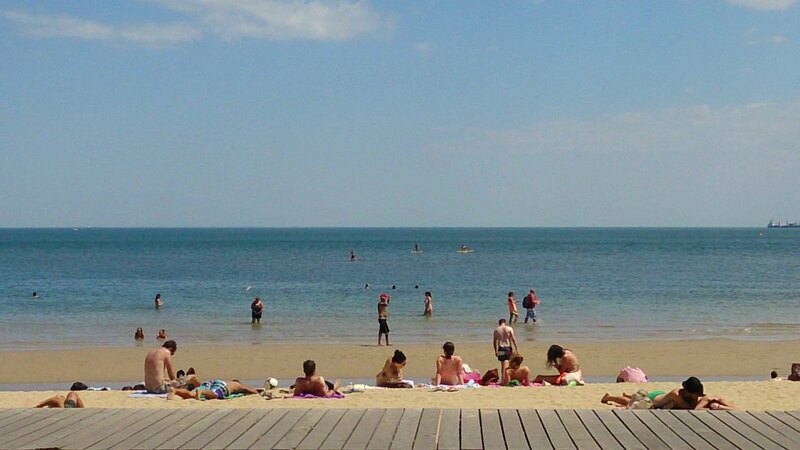 Melbourne had turned on magnificent weather, not too hot, not too cold and lovely and sunny. 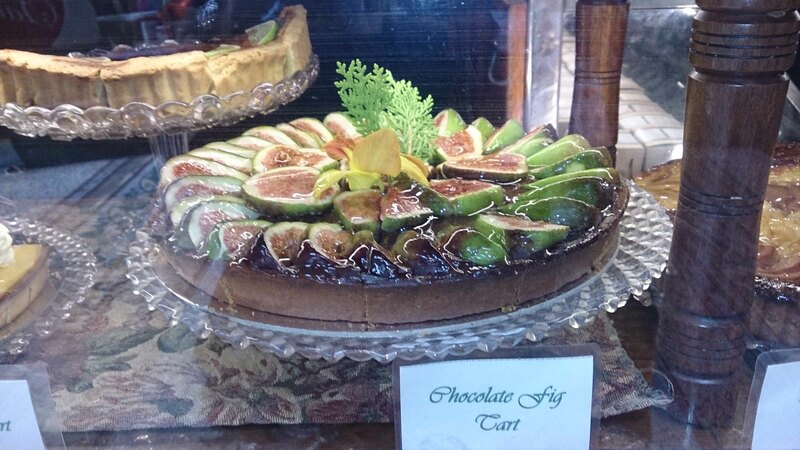 I had a little wander through one of Melbourne’s lovely arcades…how good does this cake look? I was lucky enough to meet up with my new-found cousin Bev and we had a lovely lunch and exchange of news and a bit of family history over lunch at St Kilda. People were actually swimming in the ocean …how weird is that!! No stingers, crocs or sharks!! Back on board we had a post-dinner session hosted by Thomas MacEntee in which a panel were asked for their opinions on the “Future of Genealogy”. The panellists were Shauna Hicks (Qld), Mike Moore (I think, WA), Chris Paton (Scotland) and Kirsty Gray (England). I’m not going to attempt to give you much on that but here are my take-home messages. Social media was the tie-breaker on opinions with some being devotees and one panellist scoffing at it. Blogging, tweeting and Google+ing are still seen to be frivolous wastes of time. 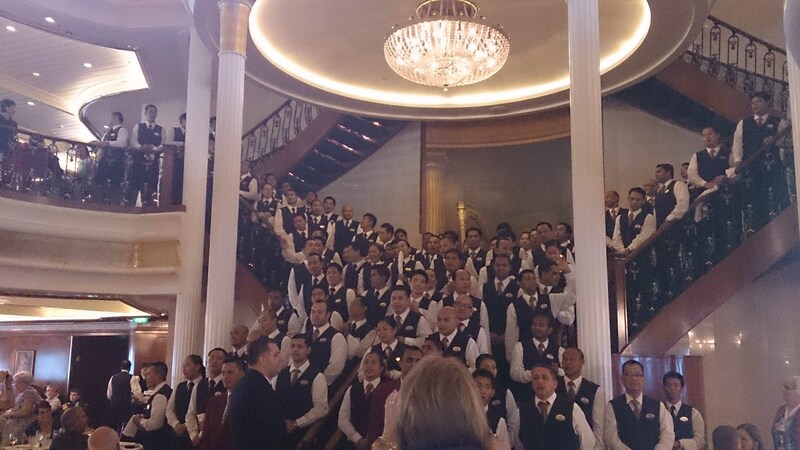 But then which group had the greatest solidarity on the ship….hmmm, the Geneabloggers! Genealogists should consider using more people power to convince governments of the errors of their ways when implementing legislation which runs counter to our interests (eg the SSDI in the States). Seems to me this is where social media just might be helpful. Chris Paton emphasised his view that more attention needs to be paid to improving cataloguing in archives rather than just digitising records. After all if other records can’t be found, what’s the point. Without understanding the context the documents lose their “sense”. Couldn’t agree more Chris. Societies need to look at how they provide value to their members and look beyond those in the immediate area. This might include digitised records which are available online only to members. Every time a member pays their next membership fee they are saying “You’ve given me enough info/services to stay with you”. Long term interest in genealogy: will it change with the demise (ultimately) of WDYTYA etc. My view is that we all started our family history because we wanted to know about our families and learn their stories. I doubt that will change though it may cause some leaf-collectors to drop away. Shauna promoted Family History Month in Australia and encouraged everyone to support it within their societies. Several speakers commented on concerns about dropping numbers of volunteers in today’s busy lifestyles. I suspect it’s more complicated than that. I did like Chris Paton’s frankness in saying he didn’t have a clue as to where we’d be in five years. Thank you everyone for thought-provoking responses to Thomas’s questions. I think there’s food for thought in the days and weeks ahead. Here I was thinking I was on the briny deep with the smell of the ocean in my nostrils. 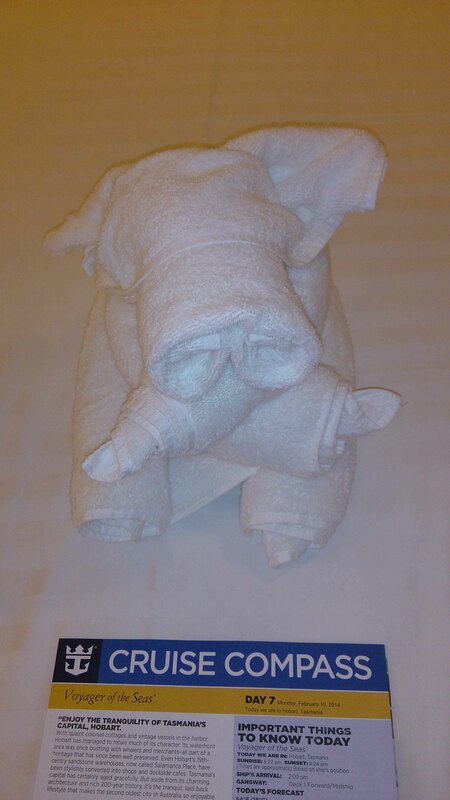 This little fellow on my bed made me wonder if I’d strayed back to Africa. There’s been lots of discussion about genea-cruising lately in GeniAus’s great hangouts. 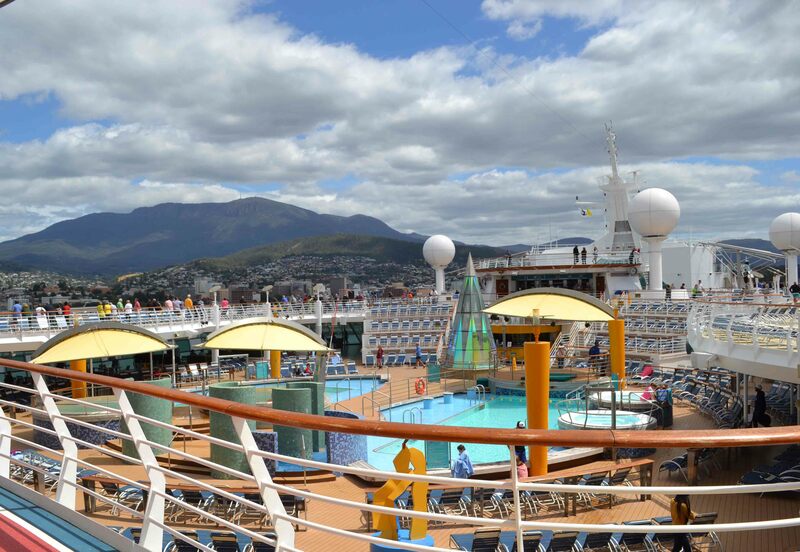 In all of our angst thinking about packing and gadding around while on board a cruise, have we not placed enough emphasis on what we might do with our spare time when not absorbed in conferencing or chattering networking with our genimates? So a few reminders of things you might want to keep in mind while on your genea-journey. It doesn’t matter whether you’re cruising, travelling overseas, or doing an interstate trip. These are some of the things I’ve experienced while researching here, there and “everywhere”. Are you going to visit a library or archive in one of the ports/cities? Have you checked what you need to take you? Do you need a passport photo, for example? I found out yesterday that you do need one to use the History Centre in the Tasmanian Archives. I got caught out in Edinburgh on my last trip and wasted time toddling off to the photo centre nearby for my pics. Actually I think Jackie is correct and I’ve misinterpreted what the archivist said “photographic ID and also something with your current address – drivers license is good” – I saw them as two different things but seems likely they’re not. Maybe there’s a sign-up form you can fill out before you get there. I sometimes use that jetlag arrival time to sign up for membership and get my bearings. I’m then good to go the next day. When I’m organised (which isn’t on every trip!) I try to have a running file of research activities, or specific mysteries I’d like to resolve using particular records. It makes it easier to maximise your effort, so if you’re waiting for document delivery you can skip through a microfilm which are usually accessible. Archive catalogues can be somewhat opaque, but somewhere on their website there should be guides to their most-used resources, and they’re well worth reading, before, during, and after your visit. I love having my family stories and information on the computer so everything I have is with me. But sometimes for all the joys of technology it’s easier to have this (or part of it) in hard copy while you’re in the archive. You can always tear it up and throw it away if your packing gets too heavy. This was something that had dropped off my radar as it’s a while since I’ve needed to do it. Not all documents in archives or reference libraries are held on site. If it takes a day or two (or even an hour or two) this can really put the kybosh on your research plans…I’ve been caught out not planning when visiting John Oxley library, for example. Yesterday I spoke to the Tasmanian Archives people via online chat and was reminded to do this. I’ve ordered up a swag of stuff in the hope of any tiny clue about my Florentia ambiguity. Check which repositories are open when, as well as where they are, how to get there, and phone/email contact details. 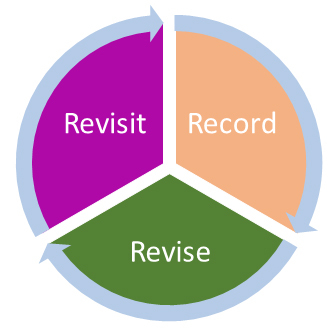 Plan your research around that to maximise your time. I put all that in a document and discard it when we move on to the next place. Libraries often stay open later than archives, even if it’s not the reference section, so you can fit a little more sleuthing in there after business hours. Check out the university libraries as well as they often have great books, newspapers and journals which are very useful – and they’re usually open later. You might be surprised by what records have been deposited with them. For example in Glasgow I visited the university library to look at a shipping company’s records – I didn’t find what I was hoping for, but at least I eliminated one possibility. If you’re planning on visiting any genealogy societies, don’t forget to take your home-state card with you as they may have reciprocal rights. Good shoes for cemeteries are a must and after tearing one pair of trousers on a cemetery fence in Ireland I won’t travel with only one spare pair of trousers. No doubt there’s something I’ve forgotten but these are the tips that have helped me in my genea-journeys over the years. 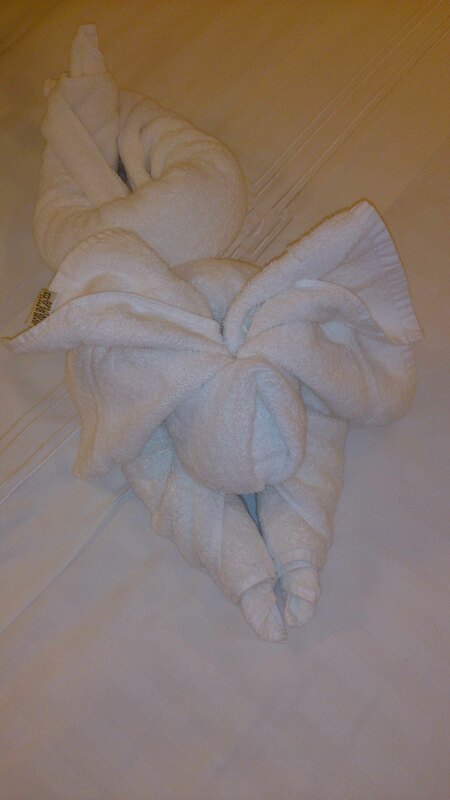 I’m lucky on this cruise as, apart from Hobart and Sydney post-cruise, I have no pressing need to do research. I’m going to have fun hanging out with “old” mates and meeting a new cousin. Credits: GeniAus has invented so many great genea-words for us to describe what we do. Not to mention all the hangouts that she’s introduced us to. Thanks Jill! The topic this week was “Packing for a Geneajaunt”. 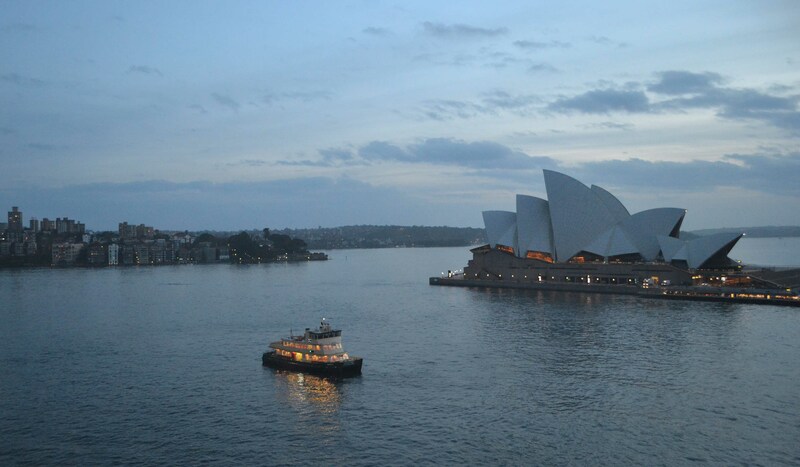 Since this time next week we’ll be sailing through Sydney Heads on the 4th Unlock the Past (UTP) cruise. My spare bed is currently inundated with bits and pieces of packing which looks like it might need an old-style steamer trunk. My husband asked, ever so politely, do you think that’s all going to fit? So what I have got on my long-list and have I forgotten anything? My Sea Pass and relevant paperwork, including personal ID. Chargers for each of course! Sign-up forms for archives if required. Headset for hangouts and skype calls home. 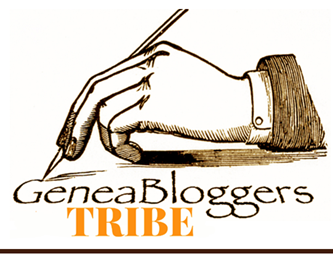 A geneabook for Jill Ball’s genea-reader forum. suction plug for extra hanging space? SPACE for gifts for my grandchildren, whose eyes sparkled when they saw the Disney characters. A light jumper and pashmina for the conference room, having been warned how chilly it is. Let’s hope I can pull off a Mary Poppins, and fit everything into my usual suitcase and hopefully <17kgs (not counting my laptop bag).